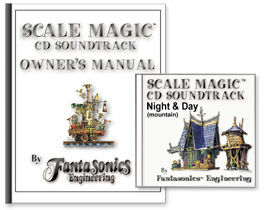 This soundtrack has all the critters necessary to set the scene for either day or night time operations. The mountain version could be a forest or tree filled landscape almost anywhere. Quiet and subtle most of the time, we've scratch built it in real time to have it's lively moments. All of our favorite birds show up at one time or another in this relaxing but fanciful scene. Day/Night soundtracks can be used in conjunction with many of our other scenes! Distribute these critters throughout a layout, and you can go from daytime to nighttime ... anytime!